Blackberry Smartphone Announced | BlackBerry Blast! If it looks like a phone, feels like a phone and makes calls like a phone, it's probably a phone, right? Yes, but if it's the BlackBerry 7100t™ phone, exclusively from T-Mobile USA, it's also much more than a wireless phone - it's a breakthrough innovation that packs all the power of BlackBerry® into a traditional phone design with full-featured phone, email, instant messaging (IM), HTML Web browsing and organizer capabilities. T-Mobile USA, Inc. and Research In Motion (RIM) (Nasdaq: RIMM; TSX: RIM) today introduced the BlackBerry 7100t in the United States and announced an early October delivery. Consumers will be able to check out the device in action tomorrow at the grand opening of T-Mobile's 1,000th retail store in San Francisco. "T-Mobile has made it a priority to provide its customers with phones and services that not only meet their professional needs, but their personal needs as well," said Scott Ballantyne, vice president marketing, T-Mobile USA, Inc. "The BlackBerry 7100t is the perfect phone to help customers balance their busy work lives and not lose a step with what's really important, like friends and family, and all for a great value." With the BlackBerry 7100t, consumers can have it all with a sleek wireless device that is decidedly a phone, but also manages to incorporate a large vibrant screen, a QWERTY-based keyboard and the full functionality and cachet of the BlackBerry platform. It is designed to easily allow both one-handed and two-handed operation. And it even passes the 'shirt pocket test' - compact and lightweight enough to carry comfortably in your breast pocket. The phone experience is uncompromising with excellent sound quality, dedicated 'send' and 'end' phone keys, a numerical phone keypad with large keys, typical talk time of more than 4 hours, a speakerphone, Bluetooth support, polyphonic ring tones and quad-band world phone functionality to keep you connected at home or in 135 countries in which T-Mobile has GSM roaming agreements. The typing experience is also exceptional thanks to an amazing new keyboard technology from RIM called SureType™ that effectively converges a phone keypad and a QWERTY keyboard to fit elegantly within the size constraints of a traditional 'candy bar' phone design. Through an integrated keyboard and software system, SureType provides users with an instinctively familiar look and feel and allows them to dial phone numbers and type messages quickly, accurately and comfortably. SureType dramatically outshines the traditional multi-tap phone approach and will fundamentally change the way people think about typing on mobile phones. Starting in October, customers who activate the BlackBerry 7100t with a qualifying rate plan, can purchase the device for a net $199.99, after mail in rebates*. Additionally, T-Mobile plans to offer customers bundled (voice and data) rate plans for the BlackBerry 7100t, starting at $59.99, that are easy-to-understand and affordable - this means big buckets of Whenever Minutes® and unlimited email, unlimited text and instant messages, and unlimited Web browsing*. "The BlackBerry 7100t with SureType is the outcome of many years of research and innovation. We've learned a lot about mobile user needs over the years and took great care in designing a product that can satisfy people who want the look and feel of a traditional mobile phone together with advanced email, messaging and browsing capabilities," said Mike Lazaridis, president and co-CEO at Research In Motion. "In looking at the complete package - including the sleek device design, top-of-the-line phone and data features, high-quality screen, breakthrough keyboard and overall value - we believe we have hit a sweet spot of mobile design that will attract a whole new audience to BlackBerry for the first time." The BlackBerry 7100t together with BlackBerry Internet Service™ is a great choice for consumers who are looking to upgrade their phone, and want "always on" access to email - whether it's business or personal email. No special servers or sophisticated corporate I.T. departments are needed. With a few simple clicks, BlackBerry Internet Service is ready to go, and customers can get push-based access to up to 10 personal and corporate email accounts (including support for viewing email attachments). The BlackBerry 7100t can also connect to RIM's enterprise platform (called BlackBerry Enterprise Server™) for larger corporate and government customers. 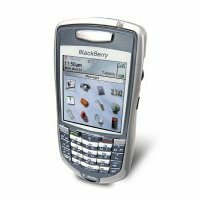 Other features of the BlackBerry 7100t include built-in IM functionality; built-in Bluetooth technology supports hands-free operation via wireless headsets and car kits; and the large, high-resolution color screen means web sites appear in living color and users have ample workspace to compose and retrieve information including contacts, emails or instant messages.